Description: This handy little field sharpener will make your pocket knives scary-sharp! The Benchmade 985547F Combo Edge Knife Sharpener features carbide sharpening blades that have a 60-degree inclusive angle (often called a 30 degree angle) that will easily re-sharpen the blade's edge without removing unnecessary metal - no matter where you are or what you're doing. This is a good angle for sharpening many folding pocket knives and hunting knives. 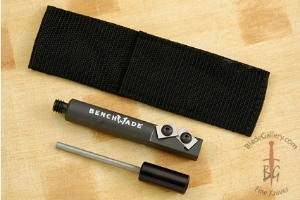 Also included is a diamond honing rod to sharpen serrated portions of a blade. The honing rod screws into the handle for storage. Black nylon belt sheath included. 4" long X 1/2" wide. 0.39013671875 0.14013671875 390.13671875 140.13671875 Trailer Completed.